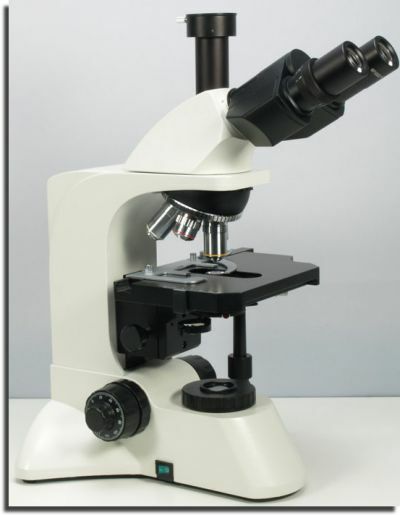 The SP200 series microscope is designed to give research standard equipment that combines quality and ease of use with prices that are competitive by any standards. The SP200 microscope is extremely well built with a very modern design, with a trinocular with infinity corrected plan objectives as standard. The microscope controls are ergonomically situated for ease of use. The low position coaxial coarse and fine focus controls and the large square mechanical stage give the microscopes a quality feel of instruments that are of a far greater price. The focus controls has a tension adjustment system, and there is an infinitely variable focus stop arrangement to ensure slide safety. The quintuple objective backward facing turret has a ball bearing race with a very definite indexing system. Plan DIN standard infinity corrected objectives x4, x10, x20 ,x40 and x100(oil) are fitted as standard. x10 widefield eyepieces. Rheostat quartz halogen 6v 20 watt illumination (240 and 110 volts), with field iris allowing full Kohler illumination. The condenser (N.A. 1.25) has integral iris and filter carrier and has lateral movement adjusters for centring. Phase contrast set and dark ground condenser options are available with a wide range of accessories including CCTV, 35mm and digital photography adapters. The full range of accessories is impressive, and includes a full phase contrast set of objectives and a simple dark ground condensers for low and high power objectives. Digital camera adapters are available . The SP200 is ideal for CCTV applications, with high resolution camera units for the trinocular head. The Minicam and Educam will both fit into either eyetube of the binocular head or into the trinocular tube. An excellent yet economical heated stage is available.